I inaugurated SOS because I’ve noticed over my years in the profit and non-profit sectors that organizations with a coherent giving strategy improve business results even if that’s not the original intent. Organizations with incoherent approaches to giving generally don’t see business results even if they give with them in mind. SOS grows your return on your investments in sponsorship, grants, and similar partnerships. Very few businesses obtain measurable benefits from their giving. SOS helps to draw a clear connection between giving and profits. 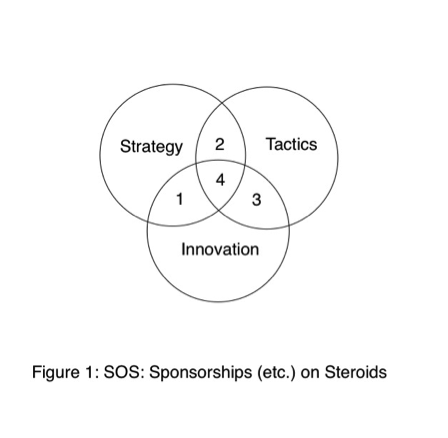 SOS takes advantage of your strategy, first-class- tactics, and cross-sector innovations. Identify untapped opportunities to drive more ROI. Ensure your sponsorships grants, and similar partnerships match, align, and augment your business strategy. Identify marketing and branding—some customized—to activate your investment. Explore synergies between potential partners and activities. Strategy: Reviewing, ranking and critiquing proposals and opportunities to match your strategy. Tactics: Creating applications, request documents and evaluations, as needed, to generate comparative information. Tactics: Identifying overt and hidden values. Innovation and Tactics: Activation advice. Innovation: Capitalizing on patterns, preferences, and connections for more meaningful, meaty, and enticing opportunities. How to connect requests to create a cohesive approach. The law firm quadruples its return on investments the first year, a return it expects to continue and grow. Rather than being proactive, many corporate responsibility plans are haphazard. To be proactive, you need a strategy, good tactics, and innovation. With SOS, I will help you strategically (how to align opportunities with challenges, how to review requests, how to gain visibility, etc. ), tactically (critiquing requests, announcing preferences, overcoming objections, etc.) and to innovate (discover untapped assets, signature experiences, and make event sponsorships more dynamic, etc.). SOS is a six-month program, enough time to help you develop a strategy, a process, and gain results. The fees are based on your current and expected giving (both in-kind and cash) and recouped through increased business, better branding, increased employee loyalty, and the better business climate you’ll create. For organizations with current and expected giving (in-kind and cash) from $20,000 to $50,000: $8,750. For organizations with current and expected giving (in-kind and cash) of more than $50,000: $12,500. Contact Karen to get SOS. Annette Zang, President/Owner, Easi-Dig, Inc.